The newest image released this morning shows the mottled surface of the dwarf planet in greater detail than ever before, taken by the Long Range Reconnaissance Imager (LORRI) camera aboard the New Horizons spacecraft. The image, taken on July 7, is the first one to be sent back after the nail-biting anomaly occurred on the spacecraft on July 4 (which has now been resolved). New Horizons was just under 8 million kilometres (5 million miles) at the time. 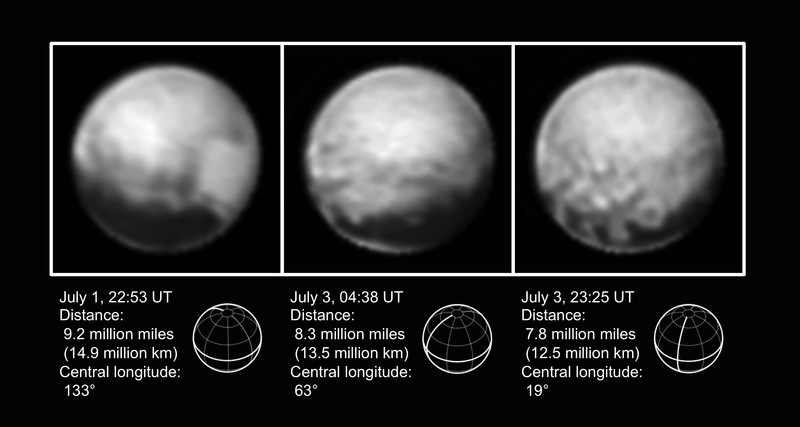 The images will only get better as the spacecraft gets closer to Pluto and its moons, with closest approach on July 14. 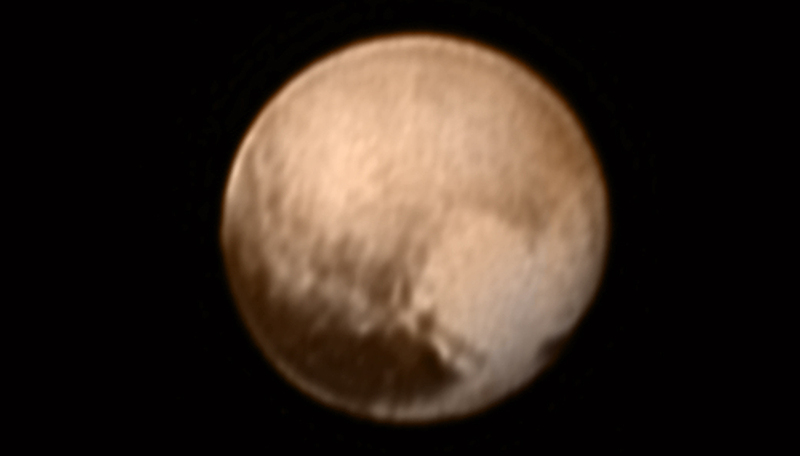 In this newest image, the view is centered approximately on the region which will be seen the closest during the flyby; this area of Pluto is very mottled with bright and dark regions. The most prominent dark area, on the equator, has been dubbed the “whale” for its elongated shape, and is about 3,000 kilometres (1,860 miles) long. Nearby is a large bright area about 2,000 kilometres (1,200 miles) across, which is roughly heart-shaped, with one “lobe” of the heart looking more squarish than rounded however. The bright area are thought to be regions of frozen methane, nitrogen and/or carbon monoxide frost or ice. At the left end of the whale’s “tail” is the bright donut-shaped feature about 200 miles (350 kilometers) across. Elsewhere on Pluto are four other large dark spots along the equator, each about 482 kilometres (300 miles) across and a brighter donut-shaped feature. Other brighter features which look like raised bumps, can also be seen just above the dark spots. What any of these intriguing features are isn’t known yet but the view will be much better the closer New Horizons gets to Pluto. In general, these images are reminiscent of the first early Mars photos sent back by space probes or as the planet was first seen in telescopes. 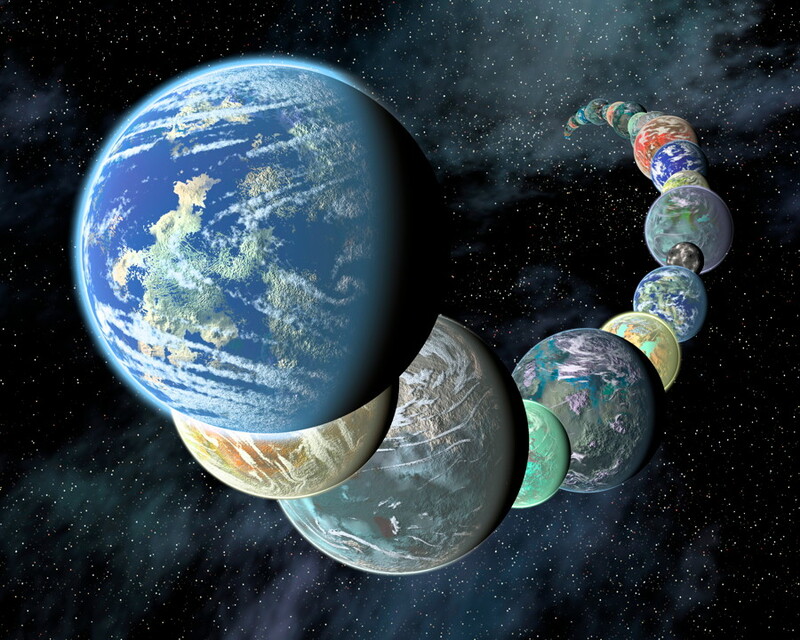 There are also similarities in appearance to Titan, although the processes occurring on Pluto are much different than either Titan or Mars. Pluto is indeed a unique world on its own. 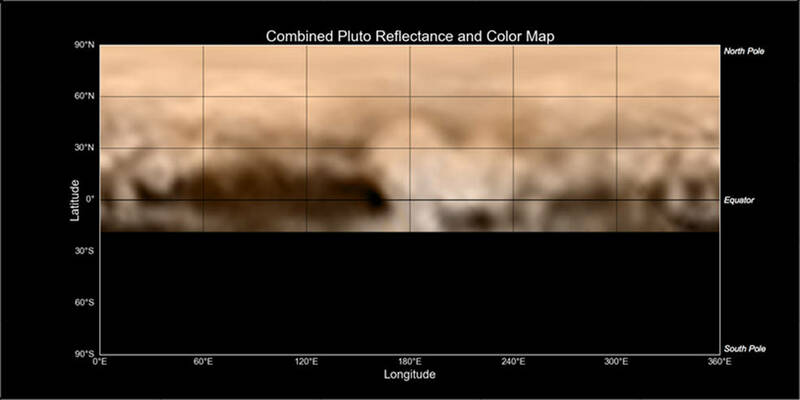 A new map of Pluto based on current images has also been released, created from images taken from June 27 – July 3, 2015. The center of the map is the region which will be seen the closest during the flyby. The maps will also improve of course in the days ahead. Now that New Horizons has safely recovered from the computer anomaly on July 4, it is all systems go for closest approach on July 14.